NPMA is looking for your assistance to help identify the most innovative and exciting speakers for PestWorld 2017. This year's event will be held at the Baltimore Convention Center in Baltimore, MD on October 25-27. Please help NPMA identify speakers and make decisions regarding the content of the program. Feel free to provide multiple speaker names and topics. NPMA welcomes both technical and business-related sessions. Submit your speaker suggestions via email to speakers@pestworld.org. Thank you for your help and we will see you in Baltimore! The second Global Summit of Pest Management Services for Public Health and Food Safety, presented by NPMA and the Confederation of European Pest Management Associations (CEPA), will be held April 3-4, 2017 at the New York Hilton Midtown. Participants will address emerging issues and evaluate - with clients and other relevant stakeholders - which action steps are required to respond to these future needs. Click here for more details and registration. NPMA is excited to announce the availability of a new training course focused on the responsible use of anticoagulant rodenticides. Commensal rodents are among the most significant public health pests that transmit disease, contaminate foods and damage infrastructure. Second generation anticoagulant rodenticides (SGARs) are an advanced and indispensable tool that require educated and trained professionals who have the knowledge and expertise to apply these products. In an effort to mitigate rodenticide exposure to non-target wildlife, several states have moved to limit the use of SGARs to professionals only, or to ban them entirely. To further our industry’s dedication to stewardship of rodenticides, NPMA has developed a two-part training course. This 60-minute course focuses on strategies and methods that will instill knowledge above and beyond state and federal educational requirements for the handling and application of rodenticides. Instructional topics include the importance of rodent management, commensal rodent biology and behavior, integrated rodent management, and the safe handling and application of anticoagulant rodenticides. NPMA Members have the chance to win big by enrolling in the NPMA Shipping Program. You’ll receive discounts on select FedEx® services and you’ll be automatically entered in the $25,000 Get Ready Sweepstakes. You can then earn up to 51 additional entries for your chance to win. Visit PartnerShip.com/NPMA to enroll now. 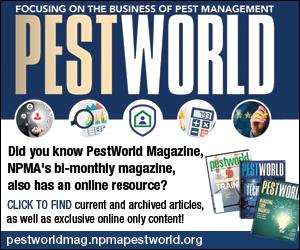 Did you know PestWorld magazine now has a dedicated website? 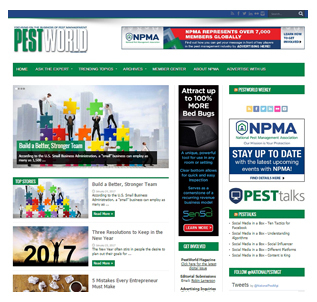 This Media Center extension of the NPMA website includes articles from current and past issues of the magazine, as well as an archive of ePestworld newsletters and new articles on relevant industry topics. Access articles by general category, view Ask the Expert topics, and stay up-to-date with NPMA press releases and recent tweets. 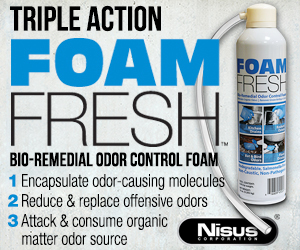 To access the site, go to http://pestworldmag.npmapestworld.org or click on the Media Center tab of the NPMA website. Want to include an article on the website? Email Robin Lamerson at robin@naylor.com for possible inclusion. Check the site often, as we will be adding new content frequently! 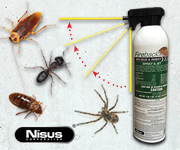 "Pursuant to the Federal Insecticide, Fungicide and Rodenticide Act (FIFRA), any product used to control, kill, repel or otherwise mitigate pests is required to be registered by the U.S. Environmental Protection Agency (EPA) for that specific use, with very narrow exceptions. Currently, there are no products registered in the United States to perform disinsection services for commercial passenger airplanes and therefore any use of a pesticide for disinsection services not in compliance with the label on a commercial passenger airplane would violate federal law." NPMA consulted with both the U.S. Environmental Protection Agency and the Department of Defense when we drafted the notice. Please click here to read the full notice. NPMA will continue to monitor this issue and provide updates as necessary. Please contact NPMA if you have any questions on this issue. Last week, the Centers for Disease Control and Prevention (CDC), within the Department of Health and Human Services (HHS), issued a notice to request public comment on a draft Programmatic Environmental Assessment (Draft PEA) for mosquito control activities funded by HHS/CDC to combat Zika virus transmission in the United States. In response to requests from territories, tribes, states, and localities for additional support to combat Zika virus through enhanced mosquito control activities, CDC prepared the draft PEA to review and address the potential impacts of activities that might be supported directly via CDC contract mechanisms or through cooperative agreements to other organizations. This draft PEA will be used to facilitate CDC’s compliance with the National Environmental Policy Act (NEPA) by providing a framework to address the potential environmental impact of such activities. The draft PEA details how the CDC will support these efforts either directly or through technical and/or financial assistance mosquito control activities of territorial, tribal, state and local governments. The focus of efforts will include: (1) Conducting mosquito surveillance; (2) Removing habitats where mosquitoes lay eggs; (3) Controlling the aquatic immature life stages; (4) Controlling adult mosquitoes; (5) Monitoring control programs; and (6) Supporting public outreach and risk communication efforts. The draft PEA specifically includes the use of pesticides and the functions performed by the structural pest management industry. 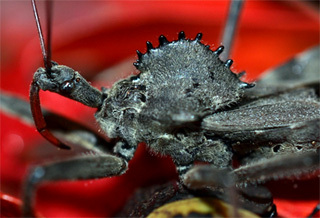 NPMA will be providing comments to ensure states and territories that need services understand how the structural pest management industry can assist. McCall Service opened a new technical training facility in Newberry, Fla. Construction started early last year. What Are Small Business Owners Doing to Grow Their Companies?